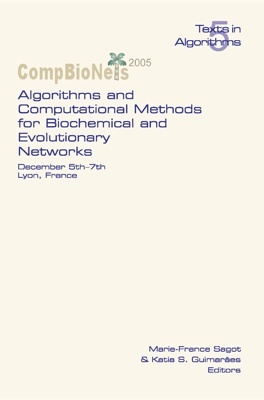 This volume contains the proceedings of CompBioNets 2005 - "Algorithms and Computational Methods for Biochemical and Evolutionary Networks", which was held on December 5-7, 2004, in Lyon, France. Submitted papers were selected by an international Program Committee of twenty members. Among the main topics covered by the Conference are computational biology in general, genetic regulation, motifs, metabolism, protein-protein interaction, biochemical networks, protein function and structure, genome dynamics, genome rearrangements, and comparative genomics. The program also included high-ranking invited talks.